OneCNC Deutchland exhibited at the Euromold International to show the OneCNCXR2 range of CAD/CAM solutions. 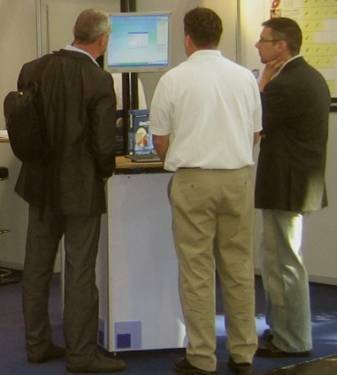 Here we see Stephan OneCNC Germany (right) demonstrating OneCNC products. 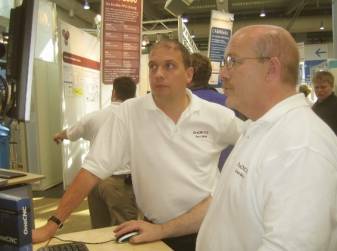 This was the first Euromold show for OneCNC Deutchland and was attended by Uwe OneCNC Germany, Stephan OneCNC Germany and Bob from OneCNC Australia. The show was very busy right up to the last minute on the last day. 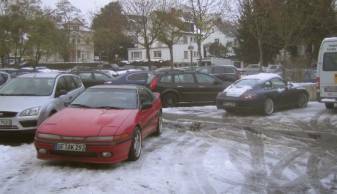 Frankfurt really turned on a cold spell Bob OneCNC Australia left Australia about 32 hours earlier at 32 degrees C only to find in Frankfurt Germany is was about minus 12C. 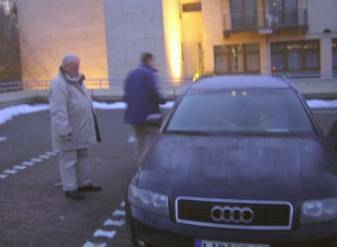 Bob OneCNC Australia (left) with Uwe OneCNC Germany (right) de-icing the car to go to Euromold. The next morning was a repeat not quite so cold but much more snow. 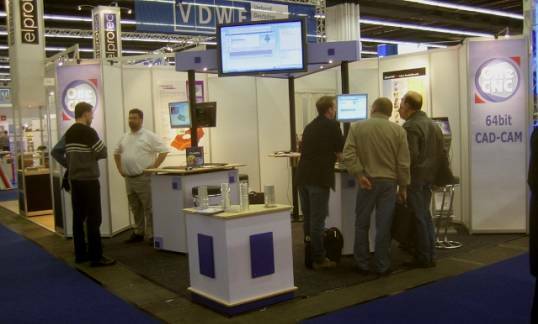 The show was very successful overall and it was decided there and then to participate in the next Euromold in 2006. 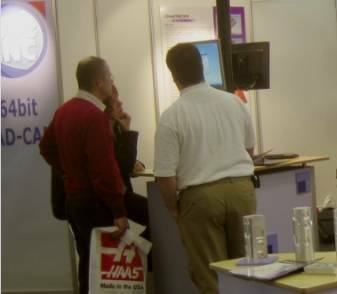 The EMO Hannover 2005 was attended by OneCNC Germany for the first time. In attendance was Uwe OneCNC Germany, Stephan OneCNC Germany, Neil OneCNC UK, Peter OneCNC UK, Bob OneCNC Australia and Ward from WMS USA. 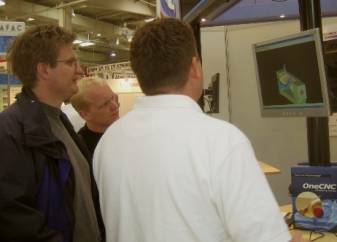 At its 2005 staging (September 14 to 21), EMO Hannover has further extended its global leadership and reasserted its undisputed role as the most popular international meeting point for the World of Machine Tools. Over 160,000 trade visitors from 82 different countries lined up to explore all the latest trends and cutting-edge engineering advancements for the manufacturing industries, as showcased by some 2,000 exhibitors from 39 different nations. 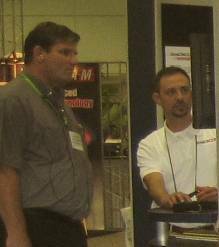 Neil OneCNC UK (left) is intrigued witth the OneCNCXR2 5 axis demo that Peter OneCNC UK (right) is creating. 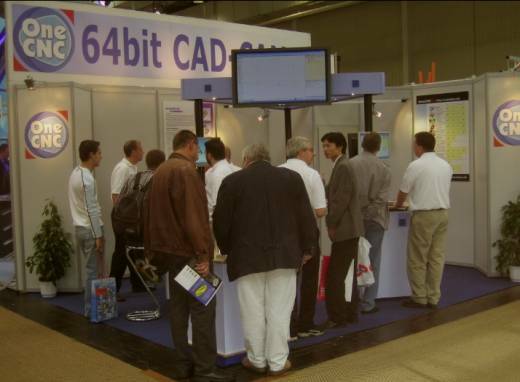 Here we see Uwe OneCNC Germany (right) demonstrating OneCNCXR2 5 axis. 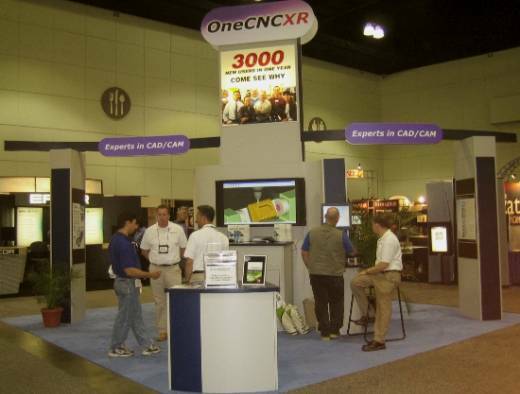 OneCNCXR2 5 axis was very popular at EMO 2005. Here Uwe OneCNC Germany (center) with 2 customers that purchased OneCNCXR2 and 5 axis. This is group assistance with Stephan OneCNC Germany (left) Peter OneCNC UK (Second left) Ward WMS USA (second right) and a customer (right and another customer hidden behind Stephan and Peter doing a combines OneCNCXR2 5 axis demo. The WESTEC 2005 Exposition & Conference, North America's largest annual metalworking and manufacturing event, was held at the Los Angeles Convention Center from April 04--April 07. Attendees had the opportunity to see the newest technologies and applications to make their operations leaner and more productive. We had 19,284. people attend the show which has not yet returned to it's former glory. Michael OneCNC USA, Kanasha USA, Uwe Germany and Bob from OneCNC Australia together with OneCNC USA internal staff and Ward from WMS kept the demo's of OneCNC XR flowing. 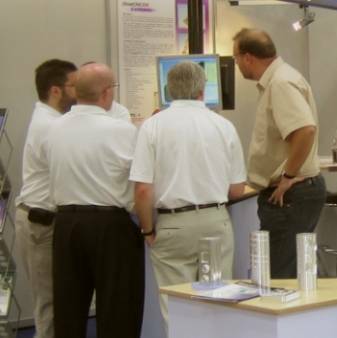 Here we see Michael OneCNC USA (right) in discussion and demonstration of the OneCNCXR product range. OneCNCXR Expert being the main product of the range was exhibited for the first time globally with the 4 axis and 5 axis multi-axis machining ability. OneCNCXR firmly established OneCNC in the multi-axis environment with a fully dynamic viewable interaction of programming with Planes.